Posted by Brendan Samuels on November 3, 2018 in Soccer, Sports, Top Stories. Back-to-back postseason victories for the Ferris women’s soccer team have them set for a fairytale ending. Two weeks ago, the Bulldogs took on Grand Valley State University (GVSU), the No. 1 team in the nation, battling the Lakers into double overtime, eventually coming out with a 2-1 loss. The Bulldogs will now have the opportunity to travel to Allendale to take on the Lakers for all the dice in the Great Lakes Intercollegiate Athletic Conference (GLIAC) Championship. Ferris dominated their GLIAC Quarterfinals matchup, dispatching the Davenport University Panthers 4-1. 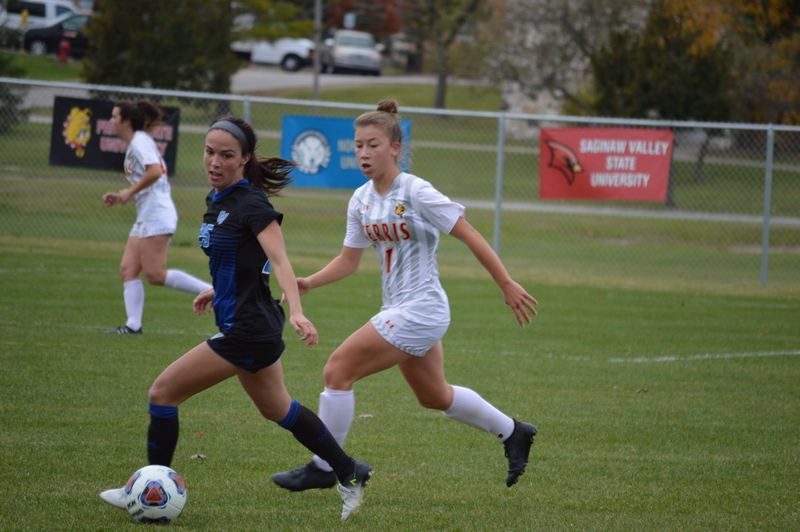 Their semi-finals matchup with Saginaw Valley State University however, gave them some trouble as they found themselves in double overtime with the score tied 0-0. The Bulldogs clawed their way out with a 3-2 victory in a penalty kick (PK) shootout. The Bulldogs’ top offensive pieces came to play in the PK shootout, as sophomore midfielder Bri Rogers, freshman forward Pia Nagel and sophomore midfielder Abigail Gilmore all netted their shots in the winning effort. Now Ferris turns their attention to the Lakers, an opponent they know all too well. The Bulldogs find themselves on the wrong side of the record, as the Lakers boast a 26-3 all-time series record. A key for Ferris head coach Andy McCaslin will be game planning against GVSU senior forward Gabriella Mencotti, who leads her team and the GLIAC in goals with nine. Luckily for the Bulldogs, Ferris sophomore goalkeeper Grace Kraft mans the net for them and owns the GLIAC’s best save percentage, blocking shots at a .860 clip. The Bulldogs’ season record currently rests at 15-2-3, while GVSU has yet to lose with a 19-0-1 record to this point. Even if the Bulldogs drop their matchup with the Lakers, they’re expected to receive a berth into the NCAA Division II Tournament, with pairing to be announced Monday, Nov. 5. Ferris and GVSU will square off 1 p.m. Sunday, Nov. 4 from GVSU Soccer Field in Allendale, Michigan.